(left to right) Kwame Brathwaite. Nomsa Brath wearing earrings designed by Carolee Prince, AJASS, Harlem, ca. 1964. Grandassa Model on car during Garvey Day celebration, Harlem, ca. 1968. Marcus Garvey Day event, Renaissance Ballroom and Casino, Harlem, ca. 1966. All courtesy of the artist and Philip Martin Gallery, Los Angeles. Black Is Beautiful: The Photography of Kwame Brathwaite, presented by the Skirball Cultural Center and organized by Aperture Foundation, New York, is the first-ever major exhibition dedicated to this key figure of the second Harlem Renaissance who used photography to amplify and popularize the political slogan, “Black Is Beautiful.” Inspired by the writings of black activist Marcus Garvey, Brathwaite and his brother Elombe Brath founded the artist collective African Jazz-Art Society and Studios in 1956 followed by Grandassa Models, a modeling group for black women, in 1962. AJASS produced the revolutionary “Naturally ‘62” fashion show featuring nonprofessional dark skin models with unprocessed hair wearing Afrocentric clothes. It and subsequent “Naturally” shows paved the way for black designers, stylists, hairdressers and makeup artists. 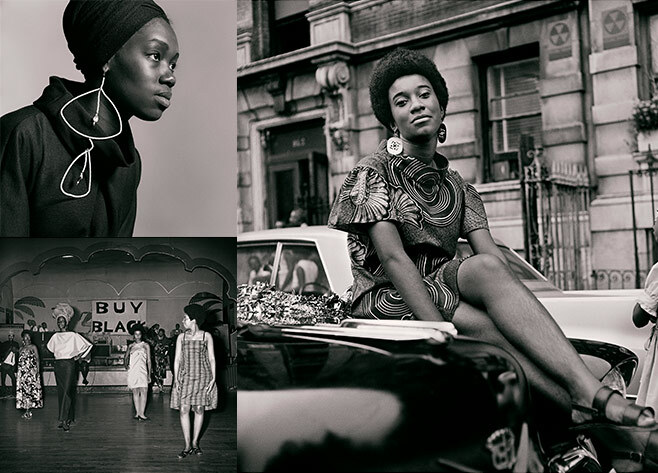 Brathwaite’s photos celebrated black beauty, helping influence magazines such as Ebony and Harper’s Bazaar to hire darker-skinned models while creating demand for new black publications like Essence (1970). During an era of enforced segregation, Brathwaite challenged mainstream beauty standards that excluded or diminished women of color. April 11 – September 19. For more information, click here. The Dorothy Chandler Pavilion at the Music center will showcase one of America’s most popular and exciting dance companies, Alvin Ailey American Dance Theater with the company‘s 60th anniversary celebration tour from April 3rd to 7th. Power and grace. Tenderness and strength. Precision and passion. For 60 years, Alvin Ailey American Dance Theater has embodied these complexities and contradictions of the human condition with dance performances that uplift and transform, making the company one of the worlds most beloved. Offering homage to traditional modern dance techniques blended with the new, the Ailey Company will perform four different programs of mixed repertory with classic Ailey works and contemporary masterworks. Each program will feature the soulful American masterpiece Revelations. Always wanted to be a dancer? Immediately following the performance on Saturday, April 6th you’ll have your chance! 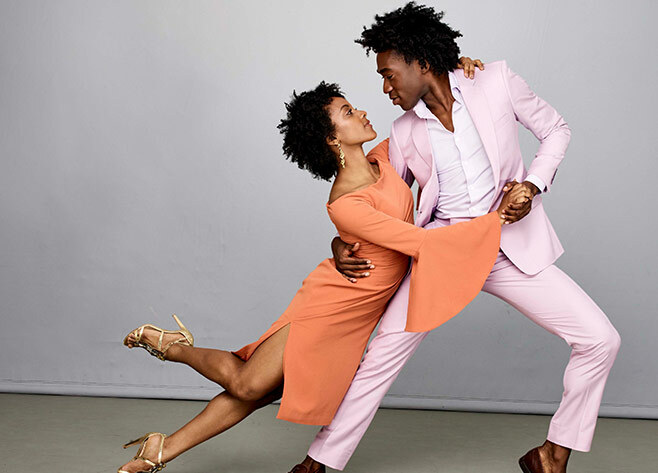 Bring your dance moves and join the party for the unique opportunity to mingle and party with Ailey company members on the fifth floor of The Music Center’s Dorothy Chandler Pavilion. Wine, beer, soda and light fare will be provided. Ailey Dance Party tickets are $75. and are sold separately from performance tickets, and can be purchased without performance tickets. For more details and purchase tickets, click here. Powerful, haunting, This Empty World, Nick Brandt’s new work presented by The Fahey/Klein Gallery addresses the escalating environmental and ecological destruction of the natural world at the hands of man. Brandt’s large scale prints demand our attention, force us to see and think about how runaway human development leaves no space for animals to survive, with humans also often helplessly swept along by the relentless tide of “progress”. Made on Maasai land in Kenya, Brandt began by photographing indigenous animals in their natural habitat. Almost always keeping the camera in precisely the same position, he then built temporary urban structures in the same location, a highway overpass, a fueling station, a bus stop. Shooting from the same fixed place as he shot the animals, Brandt filled the set with a large cast of people drawn from local communities and re-photographed the transformed space. The photographer then created a composite combining the two images in post-production creating incredibly dramatic scenes that confront urgent environmental issues, such as the scarcity of resources and encroaching industrialization. 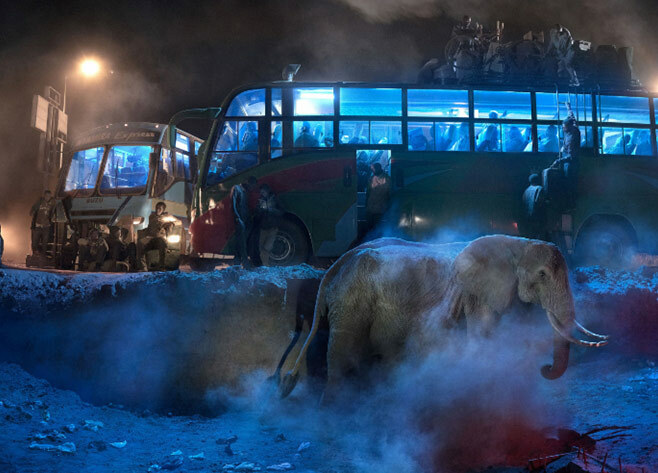 Shot primarily at night, the series shows the neon glow of urban lights illuminating passive crowds and displaced animals. The resulting images are potent and reveals the mutual suffering of animals and humans as victims of environmental devastation. 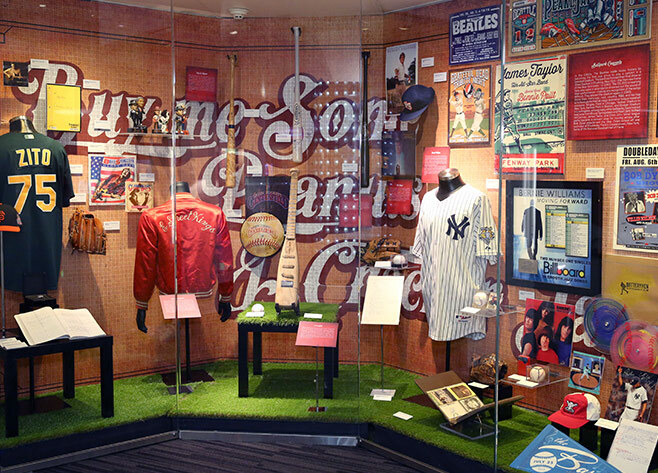 The exhibit takes us from the 1800’s when interest in baseball-themed music was fostered through sales of sheet music, through the rise of baseball songs in the era of new American music in the early 1900s, to current day popular music heralding players as they take the field and getting fans to their feet. The soundtrack of our national pastime includes everything from pop and jazz, to country, R&B, and rock and roll. I learned to love the sport while living in Chicago, so I’m excited to see beloved Cubs broadcaster Harry Caray’s microphone amongst the exhibit’s artifacts and know you’ll find something to delight as well. Now through Fall 2019, for more details, click here.